Nanay Salve Calvario’s life story is not for the faint of heart. Bold and brave. Nanay Salve Calvario never lost the ability to smile despite her tragic past and difficulties. The trials she faced from a very young age until a few years ago are among the most devastating experiences anyone can possibly encounter in their lifetime. But those painful experiences just made Nanay Salve stronger and even more determined to succeed in life. Early on in her interview, Nanay Salve broke down when she recalled her mother’s suicide when she was only four years old. That tragedy resulted in her father’s remarriage, and her separation from her other siblings. She and her older brother Rosauro were adopted by their paternal grandmother from Libon, Albay, while two of their other siblings were taken in by their father and the other two were adopted by their aunts. She was only 13 years old when she insisted to her grandmother that she wanted to stay with her Aunt and brother in Marikina, because she didn’t want to be a burden. “Ang dami nang anak ng Tatay ko, ayaw kong magpabigat na. Ayaw ko naman na mag-aral kasi yung Ate ko nag-aaral, hindi naman kakayanin ng Tatay ko,” she shared. 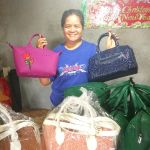 The 49-year old bag manufacturer learned the craft from her older brother Rosauro, who was an employee of [now defunct] Roma Bags, a bag manufacturing and exporting company. By the time she turned 15 years old, she already mastered the bag making craft. As with the most inspiring entrepreneurial stories, Nanay Salve’s journey is filled with numerous twists, turns and heartbreaks. After 19 years of service, she left Roma bags in 1999 to try a different path: dressmaking. Colorful bags. 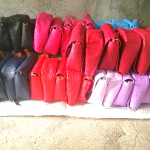 These almost finished bags are waiting to be picked up by Nanay Salve’s two assemblers. For the next four years, she worked for [now-defunct] X-Factor, a clothing company, where she sewed long sleeved polos made out of sheer fabrics such as georgette and piña sourced from Laguna. She also experienced sewing Levi’s pants and stuffed toys for export for a big Taiwanese-owned company. But Nanay Salve knew she wanted – and needed – to have her own enterprise. “Gustong kong magkaroon ng kahit maliit na gawaan na meron akong su-supply-an, kahit ilang tindahan lang yun, kasi, ang nakikinita ko, ang pagsisikap ko, kung hindi ko bibigyan ng kabuluhan, katulad iyan, mga kapatid ko, pag wala, sa akin lumalapit,” Nanay Salve sheds tears while sharing her additional responsibility of providing for her siblings and their children as well. Love at first sew. 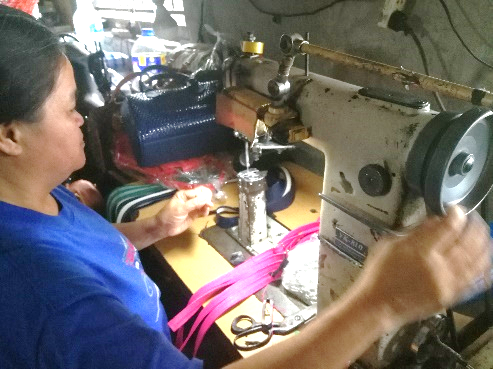 Nanay Salve’s passion for sewing led her to build her own bag making business. 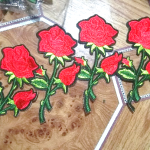 She decided to pursue a bag manufacturing business because that has always been her expertise. She also hails from a family of dressmakers and tailors. “Lahat ng mga tiyahin ko, [nasa] tailoring sila at dressmaking. Bata pa lang ako, nagtatahi na ako kasi may makina naman kami. Mahilig po talaga akong makialam basta makina,” Nanay Salve humorously shares. 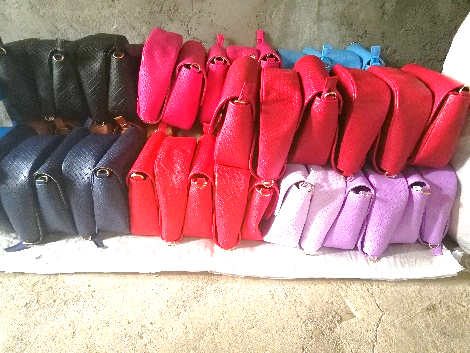 It was around 2009 when Nanay Salve began a slipper and bag-making business. She admitted she had financial difficulties then, because she didn’t want to borrow money from lenders and she barely knew buyers for her bags. She decided to put up a canteen, then a bakery, and halted her slippers and bags production to focus on her food business operations. Their house burned down two years after. Rise from the ashes. Nanay Salve’s resiliency allowed her to overcome the tragedy of losing everything she worked hard for, with grace. Nanay Salve wanted to resume her bags production at that time but all her seven machines – three Juki high-speed industrial sewing machines, three post type sewing machines and one cross arm sewing machine – were destroyed in the fire. 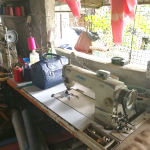 Nanay Salve estimates that her initial investment reached Php 60,000 for her sewing machines alone. Her assorted slipper making machine, which cost around Php 6,000, was also burned in the fire. When asked how she recovered from that tragedy, she shared her story of hard work and strategic decisions. Her employer-turned-partner was not always able to provide the materials she needed, prompting her to purchase all the materials herself. She would create samples and show it to her partner, but she was not always paid on time, so she decided to stop bringing her samples. She worked as a sub-con for another bag-maker before deciding to manufacture bags on her own in 2014. Beauty and strength. 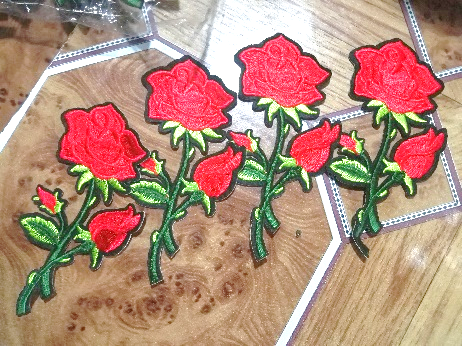 Like these rose appliques that her assemblers glue to her durable bags, Nanay Salve’s determination is nothing short of beautiful. 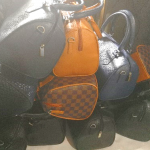 Then in 2016, she met an agent who offered to help sell her bags to retailers in Baclaran and Divisoria. That same year, she also partnered with her good friend who offered to be her second agent. After a year of doing business, her first agent used her earnings amounting to Php 20,000 for her own personal needs – to pay off a debt to a lending company, to be specific. Her good friend-turned-second agent also ended up using the Php 8,000 earnings that rightfully belonged to Nanay Salve. This betrayal was a blessing in disguise, for it pushed Nanay Salve to market her bags on her own. Shortly after this incident, she decided it’s time to brave the Baclaran market and together with her husband, Tatay Reynaldo, went around Baclaran for hours before finally seeing her bags in one of the stalls. They successfully struck a business deal with the stall owner, which also helped her heal from her agents’ betrayal. “Nakatulong [ang pangyayaring ito] kasi dun ako natuto na mag-isa, na hindi umaasa sa iba kung saan idedeliver ang bag. Natututo rin ako kung paano makipag-usap sa tao. Magandang aral na kailangan ikaw rin yung magbenta ng produkto mo kaysa sa iba. At nung may binabagsakan na ako, di ko na sila masyado iniisip. Hindi na sumasakit loob ko. Masarap yung nagkakaroon ka ng pagsubok sa buhay mo, kasi dun mo na-re-realize kung paano ka tumayo,” she says. She didn’t press charges against her two agents, since she didn’t have evidence in the form of a contract or receipts. But she now learned her lesson by issuing receipts to a buyer who sells her bags through the popular online shopping website, Lazada. Nanay Salve’s personal Facebook account also serves as her online marketing platform. Where the magic happens. All her fashionable bags are produced here in her work area. 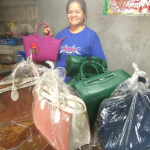 Her fashionable bags have already reached the city of Ligao in Bicol, through her cousin who operates a business there, and in Cebu. Internationally, she has sold ten bags in Singapore. She shared she has also seen her bags in the popular malls such as SM, Robinson’s and Market! Market!, and even sported by a local actress. 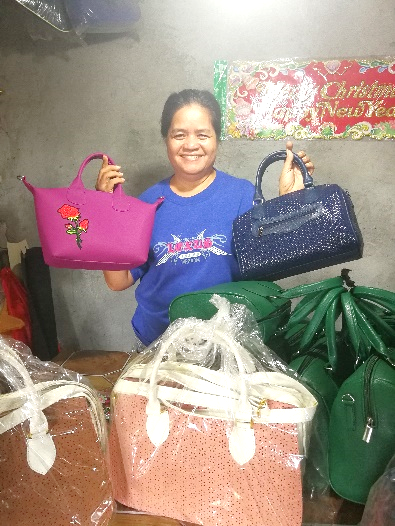 Nanay Salve’s solo entrepreneur style allows her to independently make decisions regarding her bags – from the material, design, all the way to product sampling. 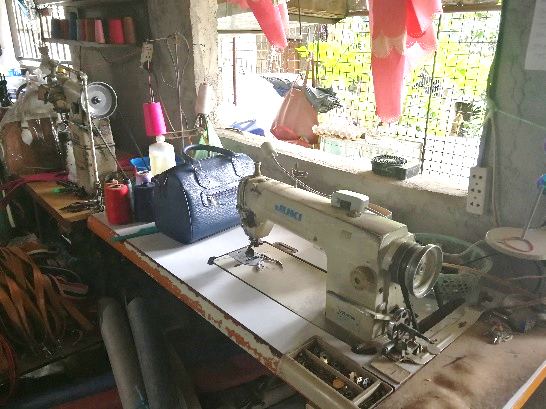 She and her husband Tatay Reynaldo are responsible for sewing the pieces of leather materials together to form their bags. Her drive for high-quality work led her to take on this task by themselves, citing some contracted sewers’ poor workmanship. “Katwiran nila, ‘Kahit ito, mag-sale-salekwang ang tahi, okay lang, hindi naman akin ito eh,’” she said, exposing how some subcon sewers think. This is why they only outsource the gluing of decorative patches and the folding of the body’s mouth and handle to two assemblers. It is evident today that Nanay Salve’s hard work, sacrifice and tears have paid off. Her family now lives in a cemented two-story home. She is the rightful owner of the land where their house is built, with her name written in the land title document. They were also able to buy two wide screen TVs and a passenger tricycle, which Tatay Reynaldo uses to augment their income. Made with love. 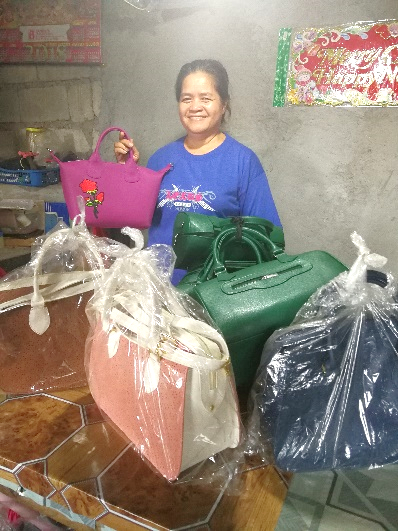 Nanay Salve’s fashionable bags are made out of her love and desire to provide for her whole family. From the start of her interview, it was clear that Nanay Salve’s devotion for her family – her husband, children, grandchild, all her siblings and their children – is what pushes her to persist in her bag making business. Her eldest, Ruby Ann, is 28 years old and works as a call center agent. Her youngest, Ryan, is 20 years old, studied drafting at the Marikina Polytechnic College and currently takes his OJT with a construction firm. Her first grandchild, Zaccheus, is 5 months old and is the apple of Nanay Salve’s eye. Stopping or quitting is never an option for her, considering that they all depend on her support. “Kaya ayaw ko mawalan ng gawa, maging pa-easy-easy. Natutuwa ako, kahit ganun, dahil lumalapit mga kapatid ko sa akin. Inspirasyon ko talaga pamilya ko at mga kapatid ko. Kahit hindi man ako yumaman, huwag lang mawalan ng pera, para in case na may mangailangan, meron akong maibibigay. Ang hirap na walang maibigay sa kapatid na nangangailangan,” she tearfully shares. In running her business, Nanay Salve values her word of honor the most. She strives to deliver her bags on the day and time she said she would. She also ensures her two assemblers get paid on time, all the time. She believes that self-confidence is important for entrepreneurs to succeed, and counts positive interpersonal relations, particularly to your employees, as a critical factor to an entrepreneur’s success. 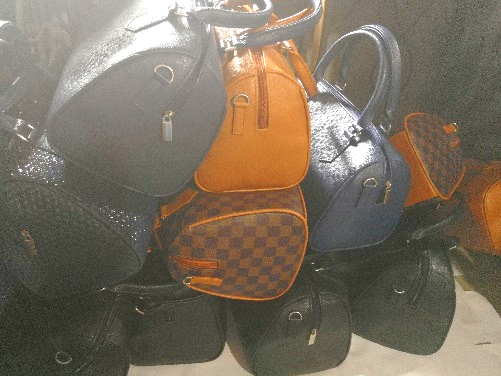 Nanay Salve also takes pride in the fact that her bags are priced lower than her competitors. She doesn’t want to hike her selling price, and prefers maintaining a low, fixed amount of profit for her bags. In exchange for her lower priced but still excellently made bags, she only asks her buyers to pay her in full, cash. She believes she can better manage her cash flow with this system. “Hindi naman po ako nangangarap ng sobrang taas. Basta huwag lang mawalan ng buyer. Gusto ko rin po magkaroon ng tindahan sa Taytay, pero gusto ko wala na akong utang,” she shares her dream to be completely debt free by the time she expands to Taytay. Judging by the way her business has grown over these years, Nanay Salve’s words of wisdom must be heeded.